I have developed man-shoulders. Not since I “retired” from swimming back in 2004 have I looked quite as burly in a tank top as I do at this moment. My newly acquired masculinity can be traced back to all of the training I have been doing for the 32 Mile Molokai to Oahu paddleboard race that will take place tomorrow morning. A mixture of anxiety, excitement and a healthy amount of fear have caused me to spend as many hours out in the ocean as possible acclimating myself to as many different conditions as I can. Being that the ocean is an inherently mysterious and unpredictable place, those training hours have been anything but boring. Each training run has come with a different situation, some good and some, well, let’s say…interesting. Like this morning for instance, when I was trying to come in to the beach through solid overhead surf. I was paddling along minding my own business ignoring the worried looks of the people around me as an overhead bomb of a wave detonated on top of me, taking my board (and half of my leash) with it. 15 minutes of swimming-induced punishment later, my board and I were safely on the beach being laughed at by my training partner who had just watched the entire thing take place. Or, the other day when we decided to paddle through an area that has proved to be “the portal to hell” time and time again…think balancing on a small piece of foam in the middle of a washing machine. These situations are mostly difficult, often frustrating, and are always a challenge, which raises the obvious question: Why? Why do I do this to myself? The answer is simple: Because it’s fun. Training-induced Man Shoulders included. 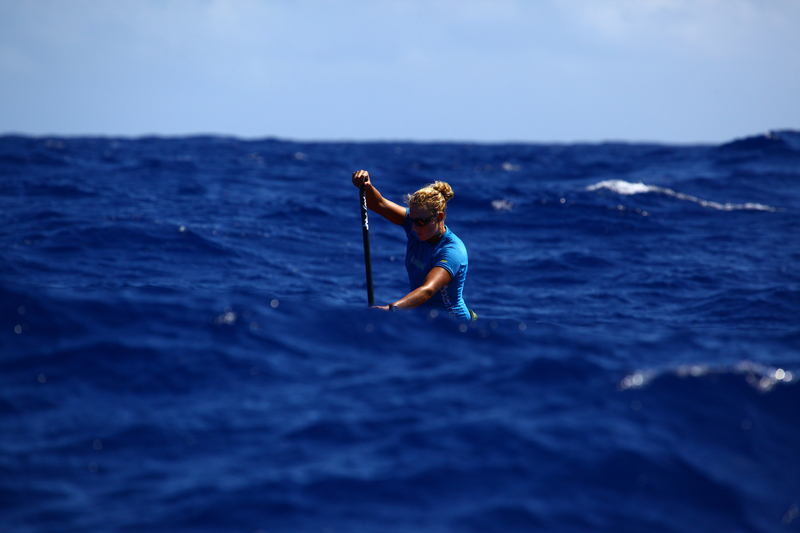 Because the ocean hands you a different challenge each time you cross the Molokai channel, the last 8 weeks have been a giant learning curve all leading up to the unknown. Each training hour logged has taught me more about myself, more about the ocean, more about overcoming a challenge and has been a consistent reminder that nothing is worth doing if you aren’t having fun. Going into a race like this, you can never be sure of the outcome, but for me, more than ever before it has been about the journey. The fact that I am sitting on a balcony on the island of Molokai with more confidence in myself than I have ever had before already makes this year’s race a success. The hard part is over. Now all that is left for me to do is to go out into the channel, catch some waves and have a good time. Good luck tomorrow. I love the quote… I need to work on it. Miss you. Be safe and have a nice ride. Safe Passage & Good Luck Morgan. Go get’ em girl.